The Cypriot “prosfygopoula” (little girl refugee) who became an “icon hunter” and a “hunter” of stolen (national) treasures. An International persecutor of (cultural) crime. A “traumatized child of war” –as she introduces herself- becomes an “Icon Hunter”, fights against cultural crime and achieves the repatriation of stolen treasures to Famagusta. A young woman, from a refugee of the bloodstained Cypriot lands, transforms into a citizen of the world based in The Hague. She collaborates, among others, with Boris Johnson and the British Museum, towards the return of the Parthenon Marbles. We met with TasoulaHadjitofi at her home, in the administrative district of The Netherlands, a bright house opposite the Madurodam Miniature Park. 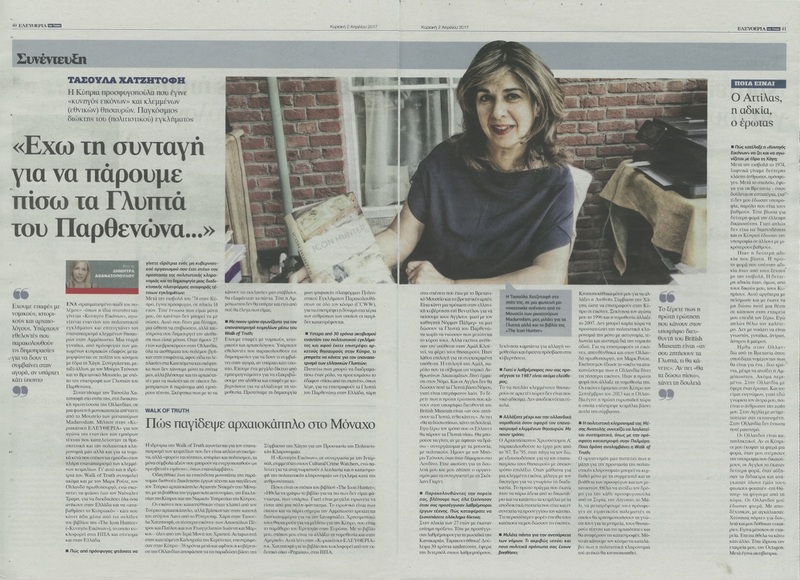 She spoke to “Sunday ELEFTHERIA” regarding her battle against the art dealers who are exploiting our religious and cultural heritage and also the legal loopholes that stand as a barrier to the full repatriation of stolen relics. For that, the founder of Walk of Truth even speaks with Mark Rutte, the Prime Minister of The Netherlands, and intends to go as far as Donald Trump, in order to reclaim all that belong to Greece and to “advance the Cyprus Problem” – something she already does through the pages of her book “The Icon Hunter”, that has been released in the US and will soon be also available in Greece. How did you become from refugee to founder of a non-profit organization that aims to protect cultural heritage and to create a digital crime-reporting platform for such crimes? After the invasion of ’74 in Cyprus, I became a refugee, at 14 years old. I felt then, that I am alone, that no one can save me. This gives you a form of power, a motivation to survive, but simultaneously creates a feeling of lonesomeness. When I was 27 years old and I was in The Netherlands, all the feelings of the war emerged, after I had seen the plundering of the Occupied part of Cyprus and thought that we are not only losing our homes but also witnessing our antiquities been sold in auction houses or illicitly by art dealers. I thought that they, turning our churches into stables, would destroy everything. If that happened, Famagusta would not exist anymore, and then where would I say that I come from?